The app allows user to change Wifi settings. If your device is unable to obtain IP address, let use this app. It also help you configure the network settings using some free DNS servers. This app works perfectly on Android 2.3 and up. It supports for Android 5.x Lollipop too. It does not work on android 6.0. When you have changed the DNS successfully, you can check the network speed by clicking on “Test Network Speed” button. It help you find out the best DNS server for your network. * Why using free DNS servers? – Add/Update/Remove DNS: You can add a new DNS server to the DNS List. You can also update/remove the DNS that you added to the list. Step 1: Turn on Wifi then launch this app. Step 2: Choose any DNS then click on Apply button. That’s all. In case you don’t want to use custom DNS anymore, please check on “DHCP” then click on Apply button. * FAQ 3. You are connected to the network but cannot access the internet, what’s wrong? Your IP device may conflict with another device in your network. 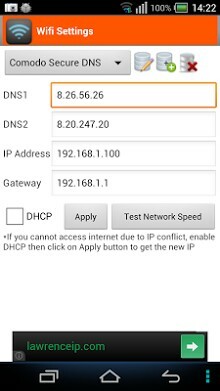 In order to get a new IP, check on the “DHCP” then click on Apply button. After restarting the Wifi connection successfully, you will get the new IP address. 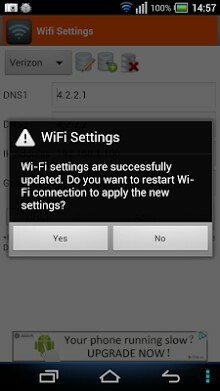 At that time, you can change the DNS manually as shown in FAQ1. – This app does NOT require root permission. – This app only works on IPv4 Wifi networks. – Each SSID gets it’s own setting, so you can default to your home or work router’s setting (which you’ve already set the way you want). Just remember to set it the first time you use a new access point.